Pig out on these Chinese New Year specials from restaurants and hotels around the island where pork is the star of the show. Unlike its Western counterpart, the pig in Chinese culture is not seen as dirty or lazy. Rather, it is a symbol of prosperity and abundance, held in esteem in Chinese tradition through the centuries. Pork also features regularly on the Chinese dining table: In major celebrations and banquets, several auspicious dishes featuring pork are indispensable items. 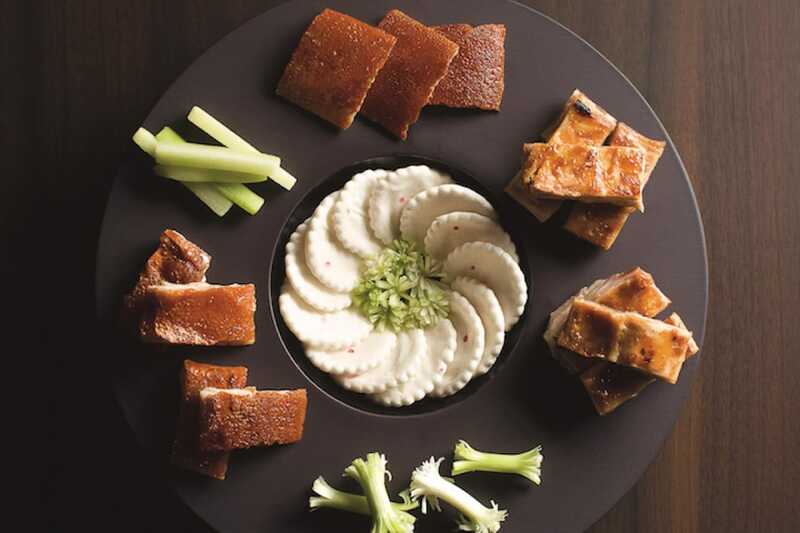 To celebrate the Year of the Pig in the Zodiac calendar, chefs all over Singapore have created special dishes featuring pork in all its delicious forms. Here are eight of them for a porksperous new year. Prosciutto, the Italian dry-cured ham, has found its way into yusheng this Year of the Pig. Hotel Fort Canning’s all-day dining restaurant The Salon is draping raw thinly-sliced prosciutto over the festive salad. The light saltiness of the cured pork is offset by the sweetness from the fruity yusheng with sliced fruit such as strawberries, mango, apple and kiwi among the usual greens. At an additional cost of $68++ per table (minimum 10 pax), the yusheng ($188+) can be shaped to look like an adorable pig’s head. A mountain of shredded radish makes up its head, which has blueberry for eyes, a snout made of lotus root and ears formed by purple cabbage. The drizzle of yuzu-plum sauce and olive oil imparts a mellow maple-like sweetness to the yusheng. The yusheng’s pig design is available upon request for dine-in only. To usher in an abundant Year of the Pig, Cantonese restaurant Yàn encapsulates the auspiciousness of Chinese New Year in its Signature Roast Crispy Suckling Pig ($288++ a la carte) in a lucky shade of red. The suckling pig is presented in three ways: First, the crisp skin of the suckling pig is served in thin squares with spring onion, cucumber and a lashing of sweet sauce atop a little disc of steamed bun. Next comes a dish of tender roasted pork shoulder and, finally, the rest of the meat is glazed with a lemongrass-infused sauce and oven-baked. Executive chef Eric Neo of Man Fu Yuan is known for his Cantonese cuisine with cross-cultural inflections. Inspired by Italian porchetta, Neo’s Chinese New Year takeaway special of roasted pork roulade ($368 for 4kg) is a play on typically Chinese ingredients and flavours. Crafted out of a deboned suckling pig stuffed with minced seafood, the roulade is steamed before it is deep-fried, resulting in a crisp exterior and tender mouthfeel. The stuffing is made of chopped fresh prawns mixed with minced pork and mushrooms. It’s a unique pork dish that marries Italian porchetta and Chinese ngoh hiang (sausage-like roll with meat and prawns seasoned with five-spice powder). “We eat pretty unusual dishes for Chinese New Year,” says Damian d’Silva, executive chef of Folklore, whose mother is Peranakan. 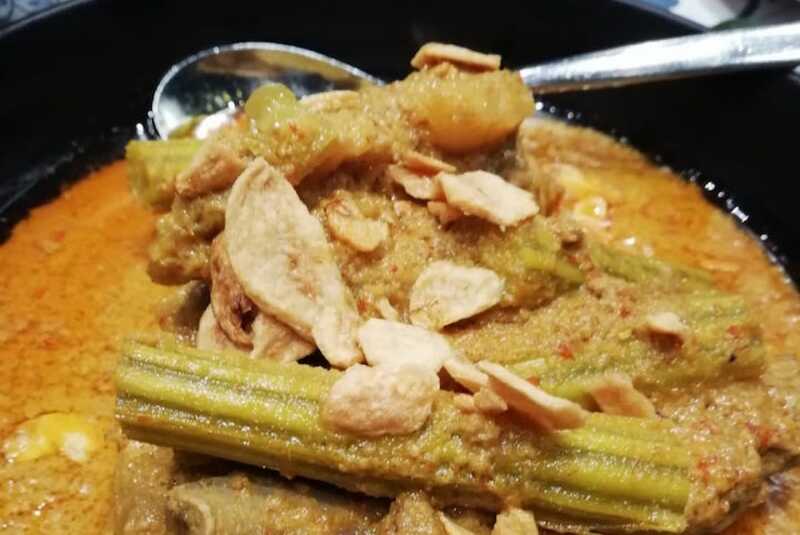 One of the festive dishes in the d’Silva household is sayur kailo, a stewed curry vegetable dish, with pork ribs (from $32). The chunky pork ribs are cooked in a piquant rempah that is pounded with chillies, blue ginger, turmeric, candlenut and belachan, before being mixed with second-pressed coconut milk. The spices of the velvety gravy is soaked up by stalks of moringa “drumstick”, which can be found in Indian cuisine. Other unusual dishes in Folklore’s Chinese New Year menu, which are available for both dine-in and takeaway, include sayur beremi, a cold appetiser made with bitter Indonesian vegetables. The bitterness of the beremi is rounded off by the sweetness from prawn stock that is jazzed up with chillies, tamarind and coconut milk. New this year in Michelin-Plated Cantonese restaurant Cherry Garden’s Chinese New Year menu is the braised pig’s trotter with six-head abalone and black moss. Created by executive Chinese chef Cheng Hon Chau, the dish has a hulking mound of glistening pig’s trotters that have been slow-braised for 1.5 hours. Sink your teeth into the gelatinous wobbly layer of fat that jiggles above the fork-tender meat. The dish is completed with six-head abalones laid out in a crescent and a bed of spinach and black moss drenched in a umami gravy of oyster sauce and soya bean paste. Available as part of festive set menus that start from $128 per person. Min Jiang at Goodwood Park’s Chinese New Year takeaway specials include this dish that showcases pork in two glorious forms with contrasting flavours and textures — the knuckle is marinated with Sichuan peppercorn and salt, baked for an hour then deep-fried to a beautiful golden crisp, while the ribs are slow-braised for more than an hour with Kimlan soy paste, rock sugar, light and dark soya sauces, garlic and spring onions. A luscious spread of honey butter is then applied to the ribs, which are then slow-baked to achieve that sweet-savoury tenderness. Generously portioned for six people, the pork duo ($147.65) is accompanied by a chilli sauce and homemade pickled cabbage which serve to cut through the richness. 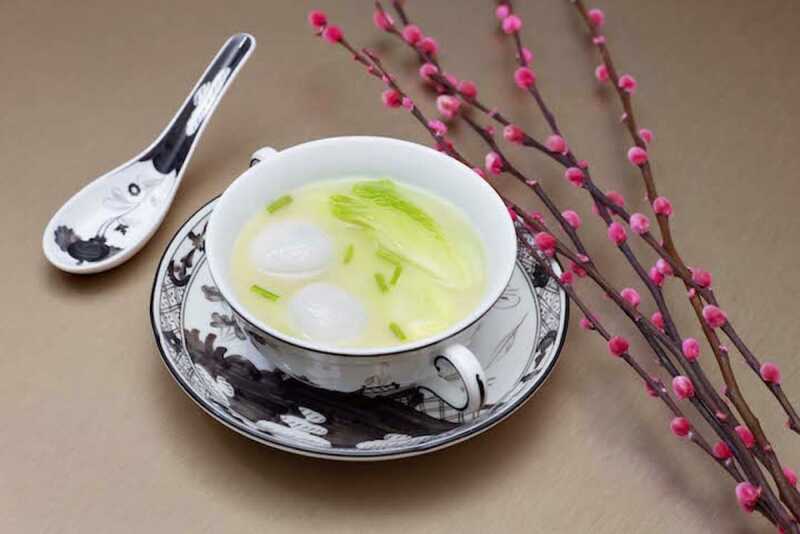 Inspired by the childhood memories of his mother making this savoury tang yuan dish for Chinese New Year, Chinese executive chef Cheung Siu Kong of one-Michelin-starred Summer Pavilion recreated this dish for diners to symbolise the reunion of loved ones. Iberico pork is minced and mixed with mushrooms, chives and diced shrimp to make the savoury fillings of the glutinous rice balls, which are then served in a light vegetable broth. Get a taste of this unique and very personal dish when you order Summer Pavilion’s Treasury Menu ($5,888++ for 10 pax) during the Chinese New Year season. Char siew and black bean sauce seldom appear in the same sentence, but Crystal Jade’s executive chef Martin Foo has slathered the punchy sauce on the meat. The thinly sliced chargrilled pork collar ($30) is tender and encrusted with a smoky layer of char. The star of the dish is the black bean sauce from Taiwan, which is incredibly umami without being too astringent and pungent. The sauce delivers just the right amount of saltiness to elevate the char siew. These cute chocolate pigs and luscious flowing cakes are some of the most photogenic Chinese New Year creations from Hong Kong, Taiwan and Singapore.